I am attempting to solve and graph the solution to an initial value problem containing a system of differential equations. If I am remembering calculus correctly, its properties (nonlinear, ordinary, no explicit appearance of the independent variable time) classify it as a 'time-invariant autonomous system'. I want to model a situation in which a microorganism in a bioreactor at some concentration 'X' is growing exponentially 'dX/dt = u*X' by consuming a substrate at some concentration 'S'. I make the assumption that this must be evaluated numerically, and switch to desolve_system_rk4(). I get an "Error executing code in Maxima", which also states "in definition f_rk_4, found bad argument 'X(t)"
Where am I going wrong? 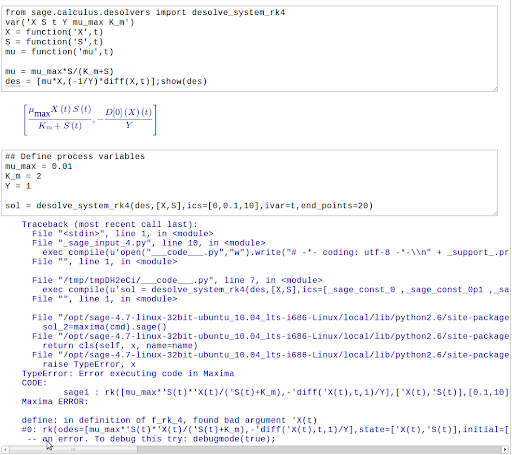 Can I use desolve_system_rk4() to evaluate this system, and I'm just making a syntax error? Thank you for your patience - I just started using SAGE yesterday. 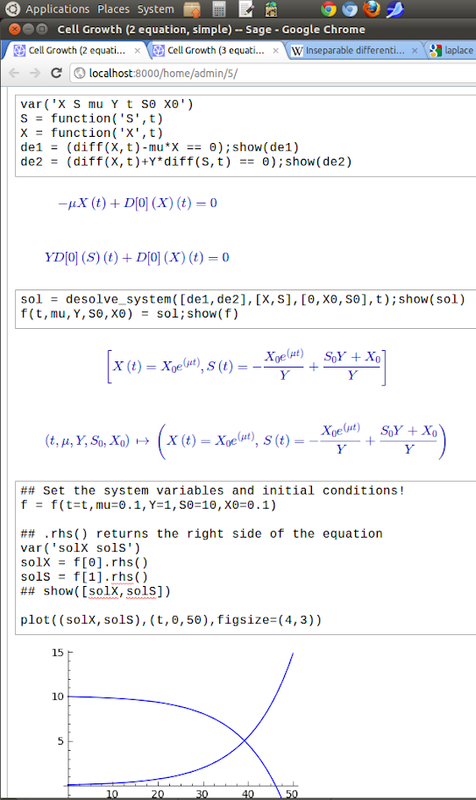 That function desolve_system_rk4 is very badly documented. I would suggest filing a bug report on the documentation. I don't know why the LaTeX expressions are giving me trouble in the answer... Maybe someone can point out the typesetting problem. I don't know how to do this. Could you try re-defining f in the first place, without using mu as a variable but instead using the expression you've given? Also, your question might be easier for someone else to answer if you copy/paste the function definitions (using the code format button to format it correctly here). Then people who want to help can just copy/paste to get their own versions to test with.